November | 2012 | Quilting my way through life! 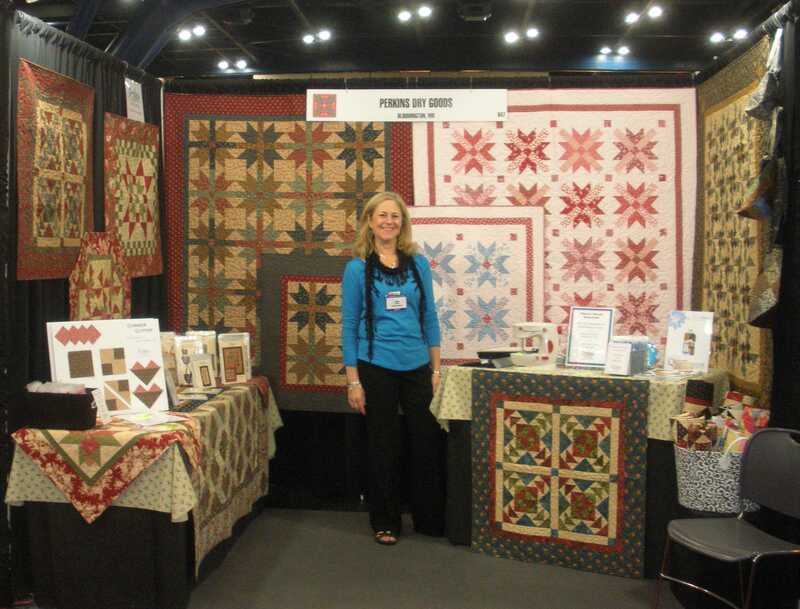 Quilters are definitely some of the most kind-hearted and generous of all people. That just makes me smile! I’m happy to be able to share in giving 3 lucky winners more inspiration to work with, so here they are. who likes my Wheels & Dashes pattern. This pattern starts with a bunch of charm squares so a lot of the cutting is done for you. who likes my In Season for Christmas pattern. This is part of my “In Season” series. There is one quilt for each month. 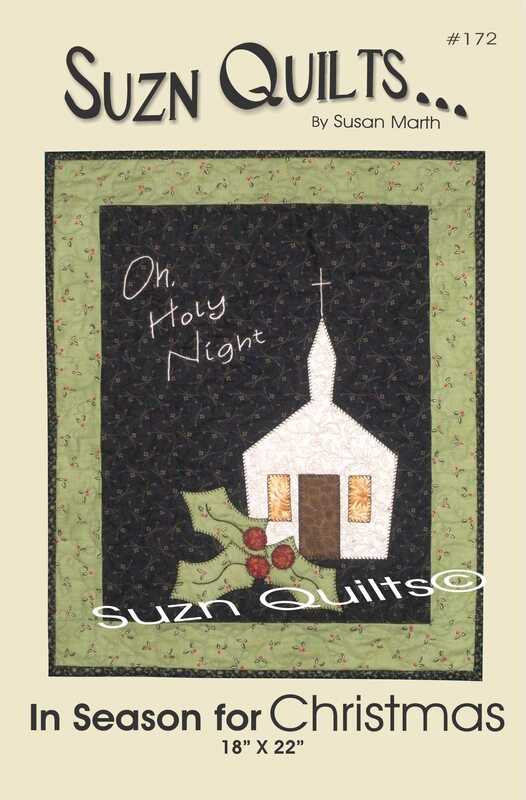 It includes a little bit of applique, a bit of hand stitching with perle cotton and just a bit of quilting. It’s quick & easy enough that Scarlette will have time to make and hang it this Christmas! 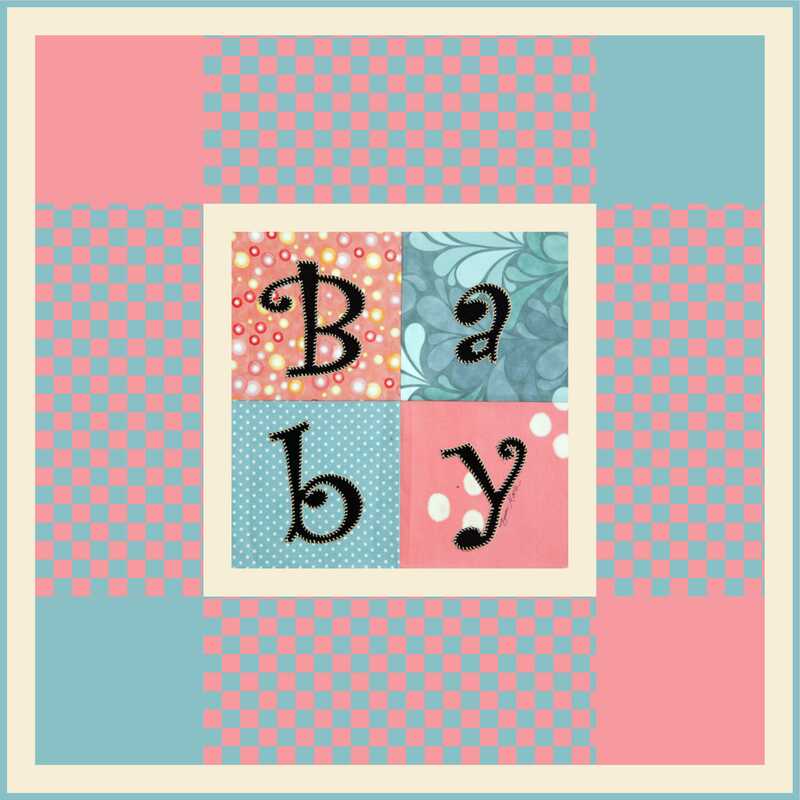 Thanks for all of the great responses to my new “Baby” block. There is more blogging fun with opportunities to win more prizes the rest of this week. 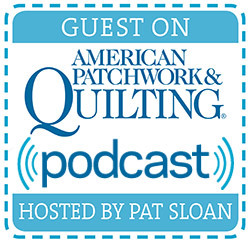 Check over at Quiltmaker for the list of participants. look for them on newsstands starting next week. 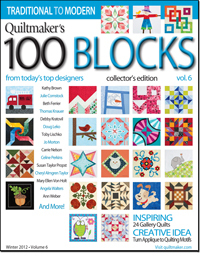 Quiltmaker’s 100 Blocks from Today’s Top Designers Volume 6!!! It’s a new issue with 100 more original blocks complete with full instructions. my new “Baby Love” book. 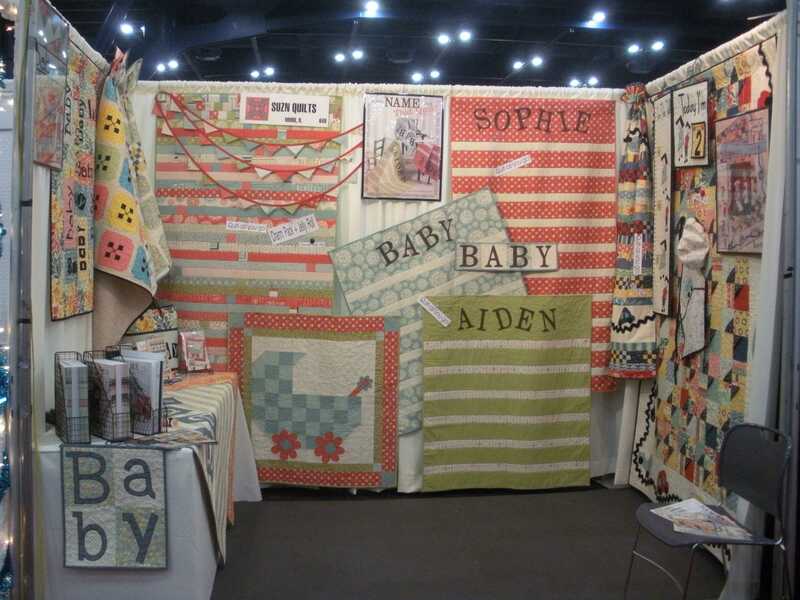 We all have opportunities to sew quilts for babies at some point in time. I can see so many possibilities with this block. Make just one block and have a cute center focal point. By adding a few borders to this block, it can quickly make a small baby quilt or wall hanging. 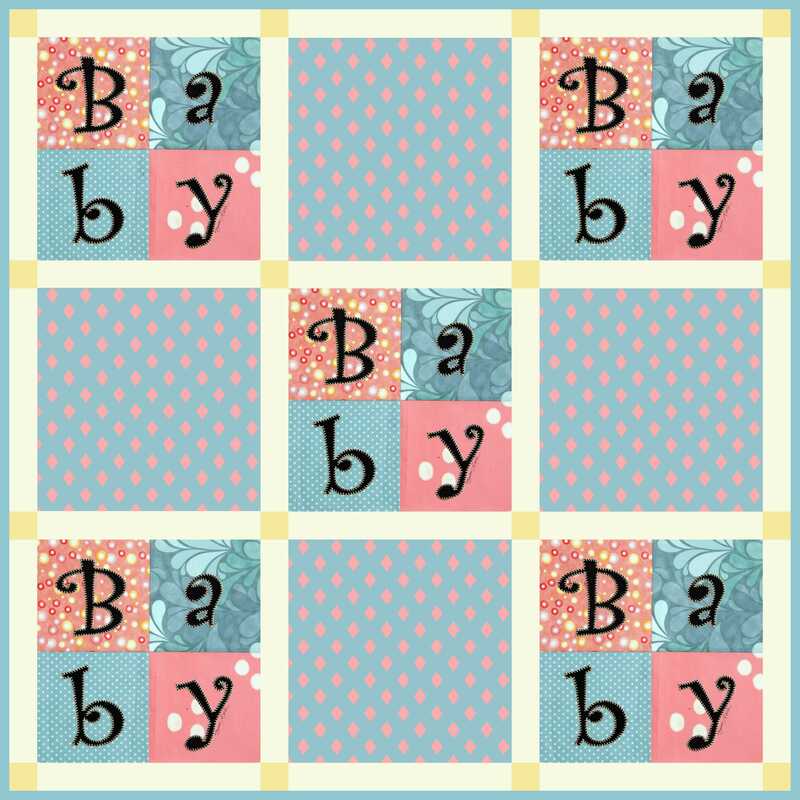 make 5 “Baby” blocks and set them with 4, 12″ coordinating fabric squares to make this 42″ baby quilt. As you know, the possibilities are endless. Of course there is a give-away! 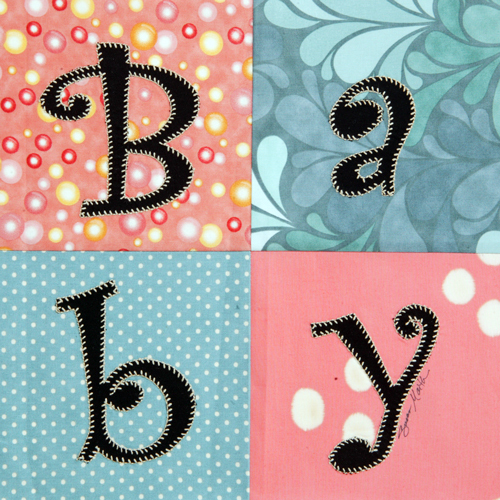 go UP, UP, UP to the TOP of this post and leave a comment letting me know how many baby quilts you’ve sewn so far. Subscribe to my blog and leave me another comment telling me which of my patterns you would like to win. If you’re already a subscriber let me know that in your comment along with your favorite pattern choice. Two winners will be drawn for a free pattern. and don’t forget to leave your email address. 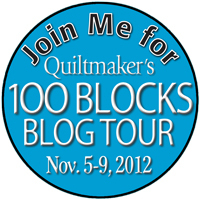 Please visit the other bloggers this week, by going to Quiltmaker’s blog for the complete list. There are lots of great prizes all week long. Yep, just one more day until all the fun begins! Let’s face it, you don’t want to see one more political commercial either!!! 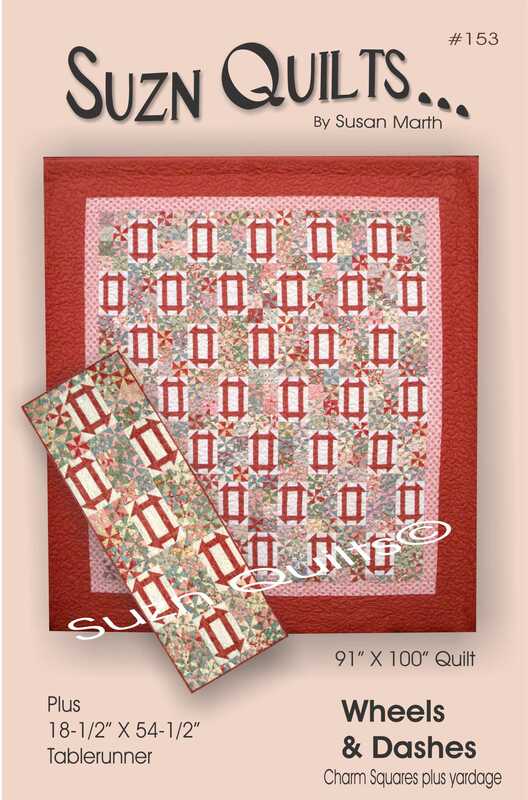 Quiltmaker’s 100 Blocks blog tour? There are lots of nice blocks to see and lots of give-aways too. My blog day is tomorrow, so I’ll see you back here then. This was my home away from home for the weekend. I enjoyed speaking to lots of shop owners about my new patterns & books. Some came from as close as Texas and as far away as Australia & Chile to name a few. 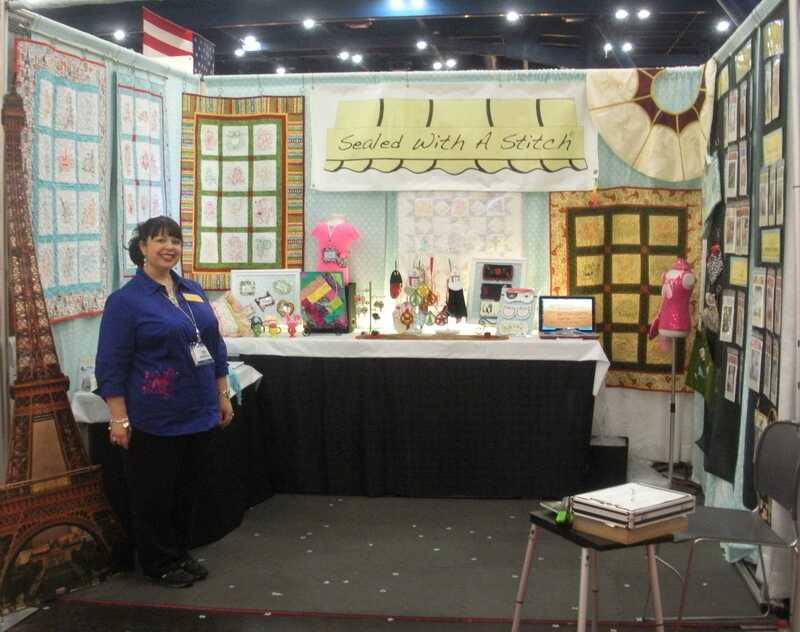 This is also where other quilt entities such as catalogs, magazines and fabric companies come to get ideas for their next business endeavors. I met up with old friends & met some new ones too, that’s the best part of market. my friend Celine Perkins, of Perkins Dry Goods. We shared a hotel & car at this market. Celine always has new, expertly pieced quilts with great patterns. 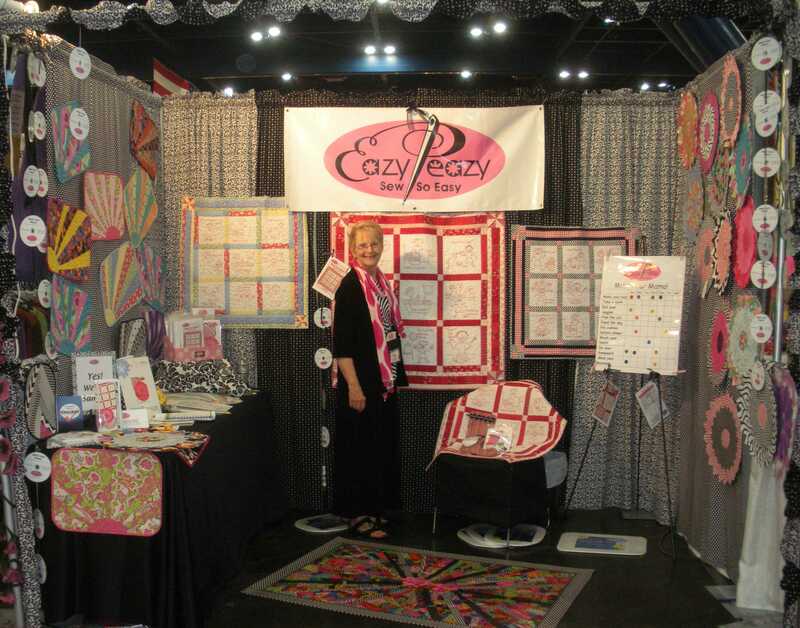 Margaret Travis of Eazy Peazy Quilts. She makes the cutest placemats with Bosal’s Placemat Craft Packs. so I had plenty of pretty to look at while not chatting with anyone in my own booth. Sue O’Very of Sealed with a Stitch. 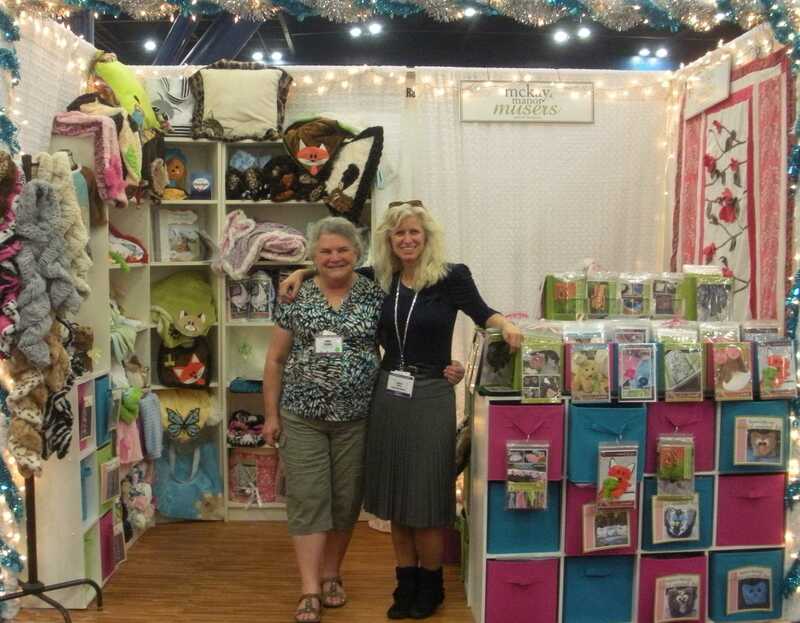 Sue has lots of cute designs for machine embroiderers. Her theme for this market was Paris. Her business cards were attached to French coffees and teas. Sheila McKay of McKay Manor Musers (and her sister). They have the cutest patterns for making super-soft animals, scarves and other cute stuff. Unfortunately, I didn’t have a helper at this market so I didn’t get out of my booth much to look around at what others were showing. Market is always a whirl wind. I work frantically getting everything done, then before I know it, I’m back home and starting the next round! I hope your fall is going well, and that you’re getting some quilting time in.